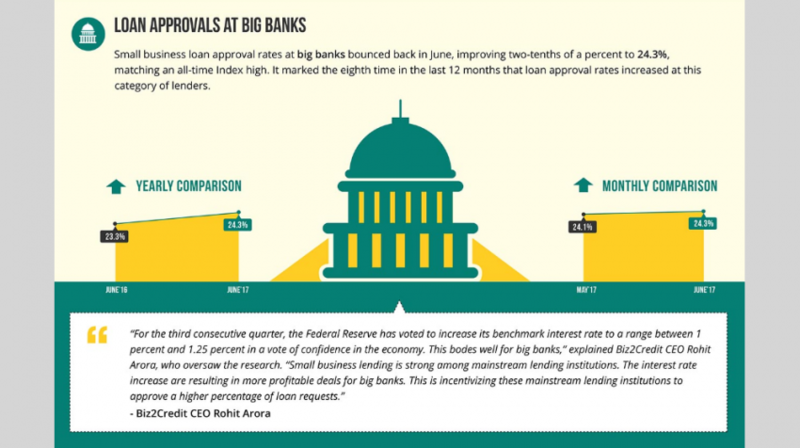 Small business loan approval rates at big banks recovered in June. According to the latest Biz2Credit Small Business Lending Index, loan approval rates at big banks improved two-tenths of a percent to 24.3 percent, matching an all-time index high. Significantly, this marked the eighth time in the last 12 months that loan approval rates improved at this category of lenders. Small banks, alternative lenders and credit unions meanwhile witnessed a drop in the percent of funding requests they approved. Loan approval rates at institutional investors remained stagnant. “For the third consecutive quarter, the Federal Reserve has voted to increase its benchmark interest rate to a range between 1 percent and 1.25 percent in a vote of confidence in the economy. This bodes well for big banks,” explained Biz2Credit CEO Rohit Arora, who oversaw the research. Small banks approved 48.7 percent of the funding requests they received in June, down from May’s 48.8 percent. This marked the second consecutive month loan approval rates dropped in this category of lenders. As far as institutional lenders are concerned, the small business loan approval rates remained stagnant at 63.8 percent. However, the percentage marks an all-time high for Biz2Credit’s Index, continuing an 11-month streak of neutral or positive gains in loan approval rates. 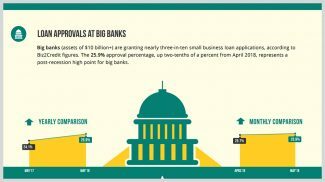 Biz2Credit’s June 2017 edition of its report analyzes the results of more than 1,000 small business loan applications. This is great news for the U.S Economy especially in states where larger corporate 500 companies don’t truly exist and most business consist of 25 employees or less. 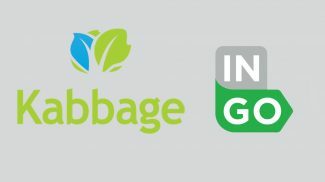 Leverage this opportunity to expand, invest, market yourself and services. Also, keep conscious that not only do your employees count on you financially, but their loved ones as well. Be smart and plan ahead for emergencies, disruptions, or things one can’t control, like a health problem. Having a reserve and a financial partner that can back you in time of need can make a world difference.